Defines a line style or stroke. Use a GraphicsStroke object with the Graphics.drawGraphicsData() method. Drawing a GraphicsStroke object is the equivalent of calling one of the methods of the Graphics class that sets the line style, such as the Graphics.lineStyle() method, the Graphics.lineBitmapStyle() method, or the Graphics.lineGradientStyle() method. Specifies the type of caps at the end of lines. Specifies the instance containing data for filling a stroke. Specifies the type of joint appearance used at angles. Indicates the limit at which a miter is cut off. Specifies whether to hint strokes to full pixels. Specifies the stroke thickness scaling. Indicates the thickness of the line in points; valid values are 0-255. Creates a new GraphicsStroke object. Specifies the type of caps at the end of lines. Valid values are: CapsStyle.NONE, CapsStyle.ROUND, and CapsStyle.SQUARE. If a value is not indicated, Flash uses round caps. Specifies the instance containing data for filling a stroke. An IGraphicsFill instance can represent a series of fill commands. Specifies the type of joint appearance used at angles. Valid values are: JointStyle.BEVEL, JointStyle.MITER, and JointStyle.ROUND. If a value is not indicated, Flash uses round joints. Note: For joints set to JointStyle.MITER, you can use the miterLimit parameter to limit the length of the miter. Indicates the limit at which a miter is cut off. Valid values range from 1 to 255 (and values outside that range are rounded to 1 or 255). This value is only used if the jointStyle is set to "miter". 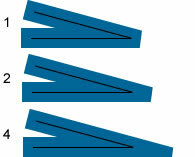 The miterLimit value represents the length that a miter can extend beyond the point at which the lines meet to form a joint. The value expresses a factor of the line thickness. For example, with a miterLimit factor of 2.5 and a thickness of 10 pixels, the miter is cut off at 25 pixels. LineScaleMode.NORMAL—Always scale the line thickness when the object is scaled (the default). LineScaleMode.NONE—Never scale the line thickness. Indicates the thickness of the line in points; valid values are 0-255. If a number is not specified, or if the parameter is undefined, a line is not drawn. If a value of less than 0 is passed, the default is 0. The value 0 indicates hairline thickness; the maximum thickness is 255. If a value greater than 255 is passed, the default is 255.
thickness:Number (default = NaN) — An integer that indicates the thickness of the line in points; valid values are 0-255. If a number is not specified, or if the parameter is undefined, a line is not drawn. If a value of less than 0 is passed, the default is 0. The value 0 indicates hairline thickness; the maximum thickness is 255. If a value greater than 255 is passed, the default is 255. If a value is not supplied, the line does not use pixel hinting. caps:String (default = "none") — A value from the CapsStyle class that specifies the type of caps at the end of lines. Valid values are: CapsStyle.NONE, CapsStyle.ROUND, and CapsStyle.SQUARE. If a value is not indicated, Flash uses round caps. joints:String (default = "round") — A value from the JointStyle class that specifies the type of joint appearance used at angles. Valid values are: JointStyle.BEVEL, JointStyle.MITER, and JointStyle.ROUND. If a value is not indicated, Flash uses round joints. miterLimit:Number (default = 3.0) — A number that indicates the limit at which a miter is cut off. Valid values range from 1 to 255 (and values outside that range are rounded to 1 or 255). This value is only used if the jointStyle is set to "miter". The miterLimit value represents the length that a miter can extend beyond the point at which the lines meet to form a joint. The value expresses a factor of the line thickness. For example, with a miterLimit factor of 2.5 and a thickness of 10 pixels, the miter is cut off at 25 pixels. fill:IGraphicsFill (default = null) — An IGraphicsFill instance containing data for filling a stroke. An IGraphicsFill instance can represent a series of fill commands.